Our OTC desk showed strong growth in October, with trading volume increasing 42% month-over-month. We also saw a 6% jump in the number of institutional clients trading OTC. The presence of active institutional traders is a promising sign for the future of the bitcoin OTC market. 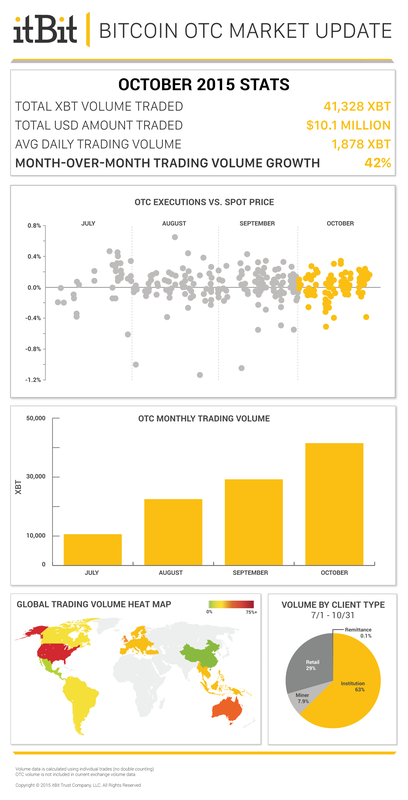 October also saw OTC trade executions become more concentrated around the market’s spot prices (OTC Executions vs. Spot Price chart below). This price tightening in the OTC market occurred despite bitcoin prices hitting an annual high towards the end of the month which is another positive sign. We are integrating TradeBlock’s order management system to enhance our OTC middle and back-office operations*. TradeBlock’s system allows us to streamline back-end processes and provide clients with powerful, customizable trading data analysis. In our ongoing effort to increase OTC market transparency across the bitcoin trading community, our team will also be using these new tools to expand the OTC data we share publicly. To learn more about itBit's OTC trading services, please contact us at OTC@itbit.com. New clients receive $50 in bitcoin upon completing their first OTC trade with us! *Please Note: Tradeblock is only being used for middle and back-office functions. itBit OTC trading clients will continue to conduct trade settlement through their existing itBit accounts.